As part of my Memoir March challenge, I posed a two-part question to several memoirist friends. What was the most difficult part of writing your memoir? How did you overcome this difficulty? Here’s the answer that Liane Kupferberg Carter gave. Meet Mickey–charming, funny, compassionate, and autistic. In this unflinching portrait of family life, Liane Kupferberg Carter gives us a mother’s insight into what really goes on in the two decades after diagnosis. From the double-blow of a subsequent epilepsy diagnosis, to bullying and Bar Mitzvahs, Mickey’s struggles and triumphs along the road to adulthood are honestly detailed to show how one family learned to grow and thrive with autism. My younger child was not yet two when the doctors told us, “don’t expect higher education for your son.” His disability was the earthquake at the center of our lives. Even though I was a journalist, I couldn’t write about his diagnosis. The pain was too raw. One day, many years and articles later, my editor at Family Life Magazine asked if I’d be willing to write something personal. She wanted to know what it was like to raise a child with special needs. And he wasn’t even talking about writing memoir. Once I opened that vein, I couldn’t stanch the flow. Essays poured out of me, many of which were published in The New York Times parenting blog. I wrote about what perplexed me. Terrified me. Gave me hard-earned joy. Eventually, I began to chafe against the constraints of a 1000 word essay. I had a novel-length story about family upheaval and healing to tell. But how do you balance sharing your family’s story with protecting its privacy? I knew what not to do. Years earlier, I’d been horrified when a woman I knew published a memoir about the difficulties she experienced when she adopted her infant son. She described him as “feral.” She revealed graphic, even appalling details about his antisocial behaviors and toileting mishaps. Did she ask his permission to tell those stories? Doubtful. Today he’s a teenager. How does he feel that there’s a permanent, public record of his early, traumatic years? Writing instructors often exhort students to write “as fearlessly as if you were an orphan.” But what are the ethics when writing about your children? How much is ok to reveal? What should the boundaries be? I would never knowingly write something that might embarrass or blame anyone in my family. But what if somehow I inadvertently jeopardized my relationships with my kids anyhow? All I could steer by was my moral compass. Again and again I checked in with myself: what were my motives in telling a particular incident? How would I have felt if my mother had written details like that about me? If the thought made me squirm, I hit the Delete key. Memoir is nonfiction. You are bound to tell the “truth.” But memory is by its very nature selective. This is only your version of the truth. Others might tell it very differently. Memoir is not about getting even or settling scores. You aren’t the victim of the story. You aren’t the heroine either. Don’t write in the heat of anger. Wait till you have enough time and distance to tell your story fairly, with empathy and respect. Memoir isn’t a diary. You don’t have to include everything or reveal all. It’s not necessary — or even desirable. Write boldly, but edit ruthlessly. Memoir requires the same techniques as fiction. The facts provide the scaffolding, but it’s still all about voice, scene, dialogue, characters, pacing, and narrative arc. It’s not therapy. The process of writing memoir can be therapeutic, but unless your writing moves other people, you haven’t done your job. Anne Lamott is lauded all the time for saying, “You own everything that happened to you. Tell your stories. If people wanted you to write warmly about them, they should have behaved better.” That’s flippant. Yes, we own what happened to us. But do we own what happened to our significant others, just because it affected us too? Especially our children, who can’t defend themselves? 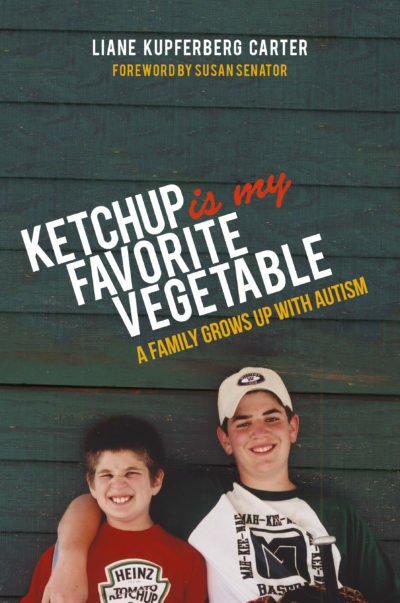 Liane Kupferberg Carter is the author of Ketchup Is My Favorite Vegetable: A Family Grows Up With Autism (Jessica Kingsley Publishers). Her work has been published in the New York Times, Washington Post, Chicago Tribune, and numerous literary journals, blogs and book anthologies. Her essay “A Room of My Own” was listed as a Notable Essay in The Best American Essays 2016. Terrific post. Your ground rules were so great, succinct and consistent with what I confront every day at the page..I put them on my Facebook page with my #memoiraholic hashtag. Great post and I love Memoir March, Edie Jarolim. Thank you. Since I didn’t write it, I can say with complete humility that I wholeheartedly agree! Thanks for coming by and commenting, Patti. Wise words, Lee: “Memoir requires the same techniques as fiction. The facts provide the scaffolding, but it’s still all about voice, scene, dialogue, characters, pacing, and narrative arc.” Brava, Jan! As usual you take the high road. You are amazing. As an author, a mom, a wife, a friend, a human being!!!!! I love how you used your moral compass. So many people don’t. This is an incredible post and thank you for interviewing Liane, a skilled writer who brings to her pages heart, wit, smarts and soul. I use excerpts from her book in the Memoir classes I teach and am honored to call her a member of my writing community. Kathy, I am grateful — and flattered! Thank you so much for such kind words. Thank you for sharing your thought process. While your writing gave us an honest insight into your world you never put the people you love in an uncomfortable situation. KUDOS! Well done and accurate, Liane. Thanks for sharing this. You have such honesty and VISION when you write, Lee. It’s not just seeing things from the perspective of an artist, it’s also being able to take a step back and really look at what you have said and how it will affect others. It’s incredibly difficult to edit or change because what you write really comes from the heart. But it is fearless and unselfish to be able to hold back or streamline your writing. That’s what makes it so heartfelt yet so effective in getting your point across… And yes, bring on those waffles!!! Memoirs are delicate, no matter whose story is told, but Liane tells hers with integrity and courage, allowing us to know her and family better. Brava on a powerful story that never wavers.